Fire Safety Rocks: Check out this copy of Tulsa Pets Magazine! Check out this copy of Tulsa Pets Magazine! You can tell when I am having a really exciting day when my tail is wagging so fast! Today is one of those days! 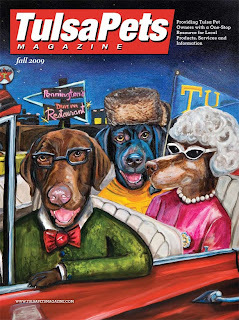 There is an article about me in the Fall 2009 issue of Tulsa Pets Magazine. Click on the link below to read the great article! High paw to all of my good friends at Tulsa Pets Magazine for helping spread the fire safety message! Click on the picture of the magazine cover to read the article! Celia Clinton Fire Safety Presentation! Visiting the Roosevelt Thompson Library!